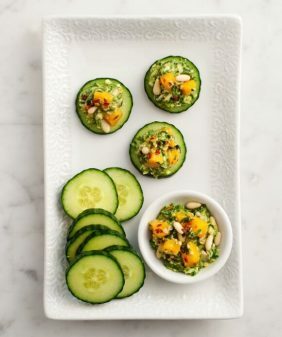 Chilled cucumbers and wakame in a sweet & tangy dressing make a quick & healthy summer condiment or snack. Sesame seeds add crunch. Vegan and gluten free. This is hands down my favorite hot weather snack. Is it hot where you are? It’s about 95 degrees here and I have about a million cucumbers growing in my garden. Sadly, in this heat, the cucumbers are about all I have growing at the moment. But I’ll take my cucumbers and be happy about them. And make salad. This one is generally in my fridge all summer long because it’s just so quick and easy, and it keeps for days. I also find that it’s a great way to add in sea vegetables. They’re not necessary here: the cucumbers are delicious on their own. But sea vegetables are really healthy for you… Give them a try! 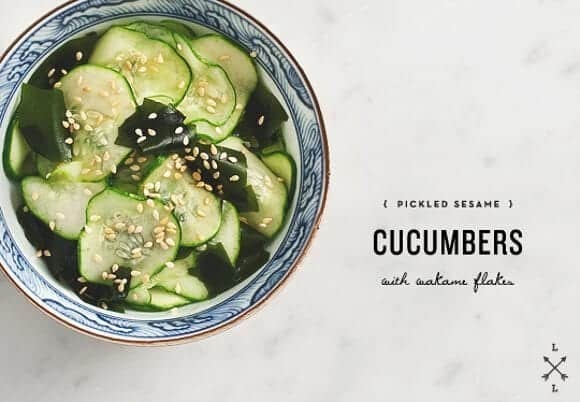 I usually eat this alone (standing up) but these cucumbers also work great as a condiment for sandwiches or burgers… an easy side to go along with whatever you’re grilling (although for a grilling side, replace wakame with red onion slices). Best served icy cold. Slice the cucumber into very thin coins using a mandolin (if you have one). 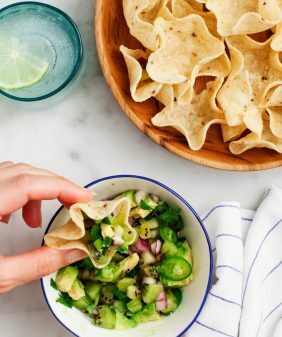 In a small bowl mix together the cucumber slices, rice vinegar, agave, and a pinch of salt, and toss gently. Place in the refrigerator for 5 or 10 minutes or up to a day. Rehydrate your wakame flakes, if using, by placing them in a small bowl and covering them with water. They will increase to about 10 times the size they were as dried flakes, and they will take less than a minute to rehydrate. Remove the cucumbers from the refrigerator and mix in the rehydrated wakame flakes, leaving excess water from the wakame bowl behind. Drizzle with a bit of sesame oil, if desired, and top with the toasted sesame seeds. You can make this ahead and store in the refrigerator for a couple of days. Love this for the unique combination of flavors! I’m always on the lookout for a new pickle to try, thanks! There are three cucumber plants just kicking off in my garden. They will either dye in this northern (arctic) heat, or I will be eating a lot of this salad this summer! 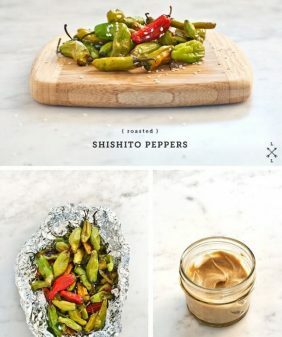 Beautiful recipe – look forward to trying it on these hot evenings. This sounds wonderfully refreshing. I can’t even imagine what 95 degrees is like at the moment (typical England weather here…) but this makes me wish for summer so much. Wakame is definitely a new one for me. Looks great paired with the cucumber. I’ll have to give it a try! So sold on this idea, Jeanine! Making it just as soon as I can stock up on cucumbers at the farmer’s market. Someday I’ll have a garden of my own and grow cucumbers, can’t wait. 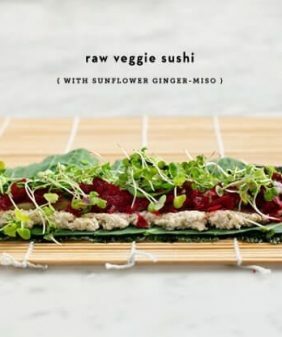 I’ve used a similar technique to make cucumber sunomono…mi love it! Looks delicious! 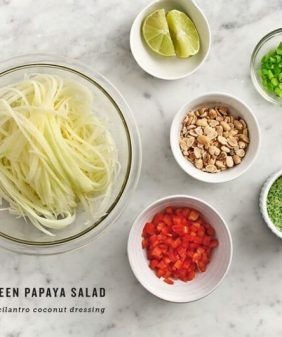 We usually make the German style of this salad, but I love the Asian-style idea! 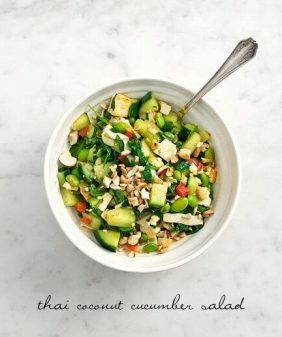 Sounds divine, I only like cucumbers when they’re in fine slivers, chunky slices are just not for me! This looks amazing! I made a similar slaw the other night to serve on top of some Korean grass-fed beef short rib tacos that we made. I absolutely love cucumbers this time of year, they are so refreshing. I love cucumbers. It was the only veggie my unrefined child-palate would eat. As an adult, I’m just as down with the cuke as I ever was. Can’t wait to try this recipe!